Landmannalaugar, perhaps the most colorful, unique, and wonderful area in the Iceland Highlands and maybe even country. This geothermal wonderland is one of the most sought-after hiking destinations but only accessible by either driving through mountain streams, rugged roads, or both. It is well worth spending at least a whole day (especially for sunrise to sunset) hiking the various trails and photographing the layers upon layers of colorful rhyolite mountains. Notice the intense colors of the land, attributable to the rich minerals and geothermal properties found throughout. 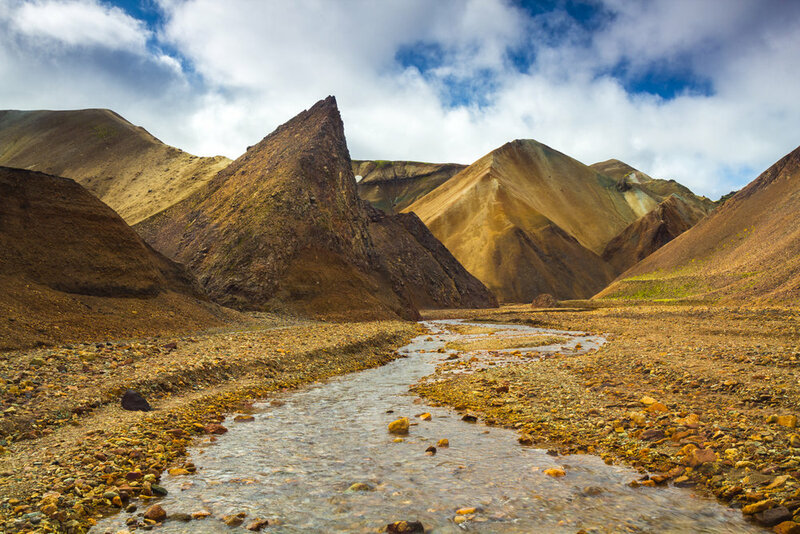 Landmannalaugar is the usual starting point for a four-day-long hiking trail called Laugavegur, whose name means "The Landmannalaugar Trail", "Laugar" being a shortened version for "Landmannalaugar". The usual four day trail ends in Þórsmörk, but one or two days can be added, trekking then all the way to Skógar nearly at the coast via Fimmvörðuháls between the two glaciers Eyjafjallajökull and Mýrdalsjökull. The vast Eldhraun lava field is one of my favorite places on Earth and created by one of the largest volcanic eruptions in recorded history. This 1783 volcanic lava flow decimated the landscape, cooled, and hardened into rock. After centuries of rain and snow, moss has grown as far as the eye can see molding itself to the shape of the rock below. The moss is more than a few inches thick at some points and very soft. The icebergs that calve off of the the Breiðamerkurjökull glacier in Vatnajökull National Park end up washed up at the surreal Jökulsárlón black sand “ice beach.” These icebergs begin to slowly melt on the black sand but are battered by the ocean waves during the process. Though sunrise and sunset could provide great colors, this place can be photographed at any time of day the typically dramatic Icelandic clouds are present. As I walked up to the beach, there were only a few icebergs around but as this one took a beating from a particularly powerful wave, it turned over and looked exactly like a swan! I couldn’t believe my luck. As the waves rolled in and out, I slowed my shutter speed to record the movement of the water as it receded, capturing this image. Only a few moments later the iceberg succumbed to the force of the ocean, fell over, and broke. Svínafellsjökull, an outlet glacier of Vatnajökull, the largest ice cap in Europe, is found in Iceland's south-east. It has always been one of my goals to capture the deep crevasses of a glacier from an elevated position and the hike that takes you up a mountain and around the side of this huge glacier allows for that without the need of a helicopter or drone. It’s difficult to convey the scale here but suffice to say that a person would appear no larger than a small blip on this massive landscape. These crevasses are extremely dangerous to walk on and one misstep could tumble you hundreds of feet below. Kerlingarfjöll is a mountain range in the interior Highlands of Iceland formed by volcanic activity and only accessible by four-wheel drive on a tough dirt road. The land is composed of red rhyolite stone, giving it a bright orange/red appearance and the hot springs are still active, generating plenty of steam and adding to the mood. The area was known formerly for its summer ski resort, but this was dismantled in 2000 and is now a national protected area.